Wednesday, 26 November dawned dark and wet at Camp Bonobo following a heavy all-night rain. 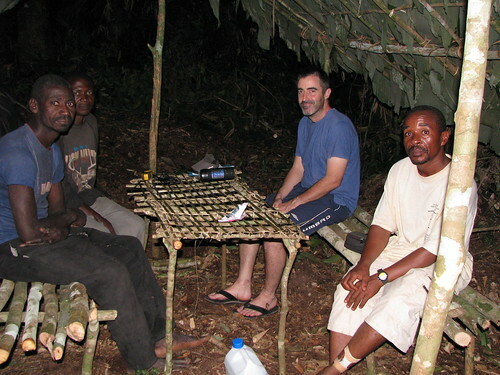 I woke wondering about the group of bonobos we had heard on the edge of camp the evening before. How did they pass the night through such rain? At 6:30 a slight break in the clouds allowed a diffuse yellowish light to filter through the trees, but at 7 AM camp was again plunged in darkness. Clouds rolled over the treetops. Ashley and Maurice at the office where they were sitting with John when the tree fell. 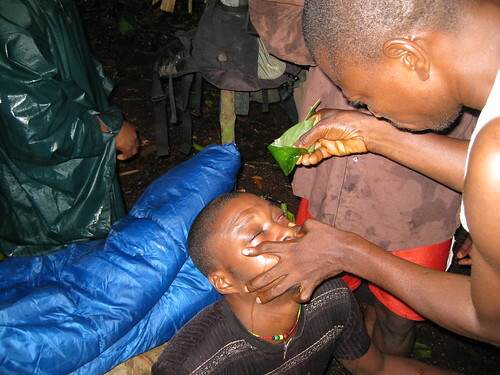 Several of us sitting at the “office”, a leaf hangar in the middle of camp, joked that we needed our head lamps so we could spoon sugar into our coffee. At the kitchen hangar, eight local field staff huddled around a fire where Vava, our beloved camp cook, was preparing the morning meal of manioc paste and dry fish. We heard a distant rush of wind in the canopy. Then suddenly the trees over camp twisted and bent as the front of wind swept over us. Abruptly, without warning there was a crack of fissuring wood. Ashley and I watched transfixed in horror as a huge tree on the edge of camp came crashing directly toward the kitchen hangar. There were shrieks. During the fall—not more than two seconds–we saw men scattering. A crash, a ground jarring clap as the massive trunk hit the cooking hangar dead center. Suddenly the scene was whipped black with rain. Vava was the most seriously injured. We feared for his life. 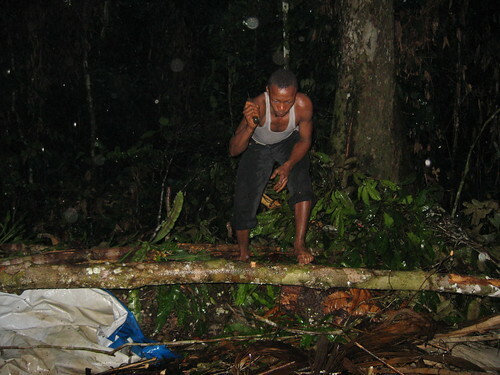 We rushed toward the treefall, shouting names above the torrential downpour, “Vava”, “Vidrak” , “Alphonse”. “Vava is hurt!” Someone emerged through the rain carrying Vava, who clutched his side, screaming in agony. I had a wrenching feeling in the bottom of my gut. We stretched Vava out on the stick bench in the office; he immediately lost consciousness. Vidrak, one of the porters was on the ground, his hands over his eyes, moaning. Pablo, sitting in a pool of accumulating rain water silently contemplated a gash along the side of his leg. I felt Vava’s pulse, strong and steady. I whispered my thanks. Alphonse washes out Vidrak’s injured eye with clear water. The hangar had been obliterated. 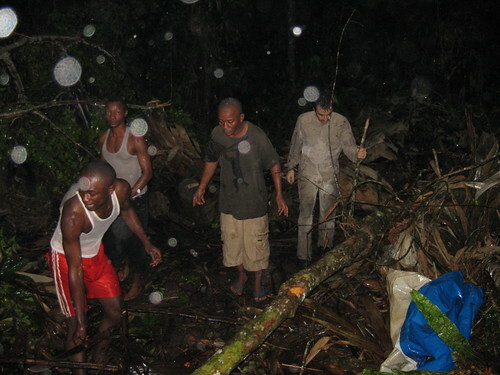 Food stocks, cooking pots, clothing, even some of the machetes were lost under the crush of branches. The tarpaulin that had covered the hangar was partially buried by the impact of the meter thick trunk. Under a makeshift covering put together quickly from scattered thatch, we kindled a fire with dried resin and heated water to treat bruises and gashes. We all huddled together for a round of hot tea. Then, before the rain stopped and with the nervous energy of lucky survivors, the able- bodied attacked the tangle of branches. The clang of machetes and axe rose above the subsiding rain. Despite the continuing rain, we started to clear out the branches. The fallen trunk gave the best angle for attacking much of the depris. 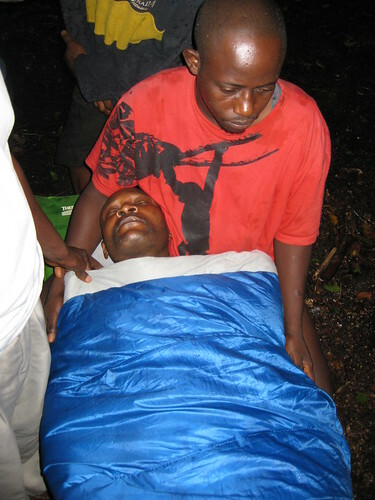 Mid-afternoon we carried Vava and moved with the other injured to our base camp on the Lomami River, 4 kilometers away. Word traveled quickly. The mother of one young local worker walked 15 km to arrive the next afternoon. Her son had to return home for a ceremony thanking ancestors for his escape. Maurice asked that I give special dispensation to buy the rest of the field team several bottles of locally distilled whisky, “to settle their nerves and help them forget”. I didn’t tell him that I had had a sleepless night myself, the crack of timber fracturing overhead still echoed in my ears. This entry was written by Terese Hart, posted on 2008-12-02 at 1:44 pm, filed under About the project, Bonobo, Bushmeat, Okapi. Bookmark the permalink. Follow any comments here with the RSS feed for this post. Post a comment or leave a trackback: Trackback URL. I am so thankful that the injuries due to this tree fall were not worse. What an experience! The way everyone immediately worked together to look after one another, and clean up the fallen tree is beautiful. I did not know that you could kindle a fire with dried resin! You describe this unfortunate and harrowing event so vividly that it seems as if I were there myself. I hope everyone recovers from their injuries and may you stay safe while you continue your important work.